Some might say that false lashes are enjoying a renaissance, but to me they never went away! I love the instant drama and alluring appeal of a set of false lashes and the market is simply flooded with lashes for every type of alter ego! It seems that celebrities are experimenting with the effects of different types of lashes, too. Evan Rachel Wood [always flawless] has gone for a Wide Eyed lash. Try False Eye Lashes 08 for a similar look – these are all about length, length, length! Dita Von Teese loves the kitten-esque lashes that give her eyes width and emphasise the heavy liquid liner. Try False Eye Lashes 13 for this 1940s look. Not only are the cool kids wearing them on the traditional top lash line, but bottom, eye brows – even off-centre. 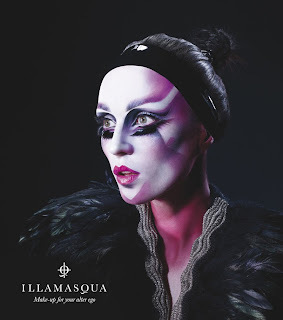 At Illamasqua we have been championing unique lashes since we launched and have steadily built on our lash offering every season. From the doe- eyed 20s with the Sirens SS09 collection to the colourful mix of 22,23 and 24 our lashes are unique to us. The new Body Electrics collection will also come with a new set of lashes. These actually drew a gasp from me when I first saw them as I have honestly seen nothing like them…!